Mallomars are a weird Northeastern United States phenomenon. If you have not lived in New York or New Jersey, you may have never seen one. I found these at my local Big Lots in San Francisco. I guess they put out too many of them, and sent them out here to get eaten. They only arrive in the Fall and then they disappear. I think we can all think of examples of seasonal food, such as strawberries in the Spring. 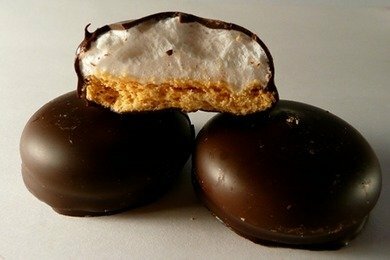 Mallomars are an example of seasonal junk food. I haven't really heard of any others. I have given Mallomars a yellow face because they taste super delicious and they are only 110 calories for 2 cookies. If you keep it to 2, you have had a pretty yummy treat, and the calories slam isn't so horrible. The dark chocolate, marshmallow, and cookie combination is very satisfying. A couple of years ago I found some at a Wal-Mart and a Kroger in Toledo, OH, but have seen nothing since. I have to order mine from online. Comedian Dennis Miller is a huge fan. . . It doesnt make any sense to slam Oreos for being 55 kCals apiece yet say these are 'okay,' even though they are the same kCal content. These are junkjunkjunk food!